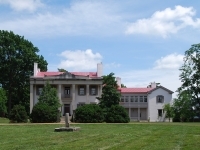 The plantation was founded in 1807 by John Harding, who brought thoroughbred horses for racing and breeding to Tennessee from the commonwealth of Virginia. Despite a horse racing hiatus during the Civil War, the Belle Meade Plantation developed under Harding and in 1867 he held the first sale of horses bred on his farm. Visitors to the plantation today can view the authentic Civil War bullet holes that riddle the old mansion's pillars. Among the outbuildings that survive on the 12-hectare (30-acre) site is one of the oldest houses in Tennessee, a log cabin built in 1790. There is also a carriage house, visitor centre, tearoom, and gift shop. Tours of the antebellum furnished mansion and grounds are given by guides dressed in period costume.